The religion of atheism is irrational and fundamentally flawed. 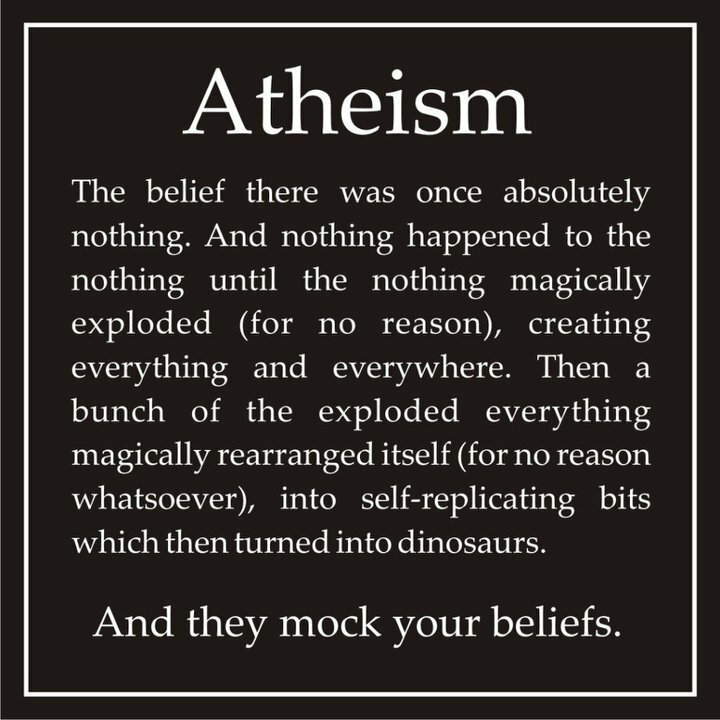 Although many who call themselves "atheists" claim to have rejected the existence of God through "reason", they have failed miserably, deceiving themselves and perhaps deceiving others. The irrational, unscientific worldview called "evolution" is a cornerstone of atheism. It gives their religion a veneer of intellectualism, and they refuse to acknowledge the multitudinous failings of evolutionary theories. They prefer to continually prop up the failed "science" of evolutionism for emotional comfort. Atheism is incoherent, lacking the necessary preconditions of human experience. There is no plan for the life of the atheist, since everything is an accident of nature. This also means that there is no foundation for morality (I can name atheists who will say and do anything because their "morality" is based only on their immediate desires, and they are useless for humanity as a whole). What passes for "reasons" to embrace atheism are actually emotionally-driven excuses to hate God, the Bible and Christians; there are no reasons for atheism. If they will take a few minutes to be honest with themselves and actually think instead of pandering to their atheopathic friends about how they ridiculed Christians and "found" another excuse to hate God, they would see that they need answers. The biblical Christian worldview has the necessary conditions of human experience, and answers the questions of life that atheism and evolutionism cannot deal with. Having second Weblogs on Posterous was a silly idea, I admit. Since this Weblog is a general purpose thing, I did not really need to use it. But I wanted to try it out. Posterous is a good idea that is poorly executed. You can upload MP3s and some other things and they make it accessible to everyone. The main problem is that they were down a great deal of the time. Another problem is that for having a Weblog like Blogger, Wordpress and others, fuggedaboudit. The concept was good for multimedia but I did not like it for trying to write something up. After they were bought out by Twitter, they became even more unreliable. One time, it took me almost a week to get a good connection to be able to edit one post. Worse, one of my Posterous Weblogs had content vanish! I sent them an e-mail, asking what was going on. No reply. After several days, I fully deleted the account. I know of one page that was there, it contained public screen shots of atheopaths showing how rotten they can be in their own words, mainly from Twitter. The other stuff on that place, I don't remember. Whatever it was, I keep everything backed up so I can start over at another location. "...we'd love to answer your questions." Rubbish! They ignored my question. Also, they do not even provide a feedback form asking why you're canceling like some other services do. But if they ever want to know why, they can read it right here. So, I'm done with the hassle of trying to deal with Posterous. Not that it matters, many people have never even heard of them! Addendum: An atheopath is claiming credit for that one site on Posterous being down. But since he is famous for lying, libel and defamation, I doubt that it's true. Even if it was, it does not excuse such terrible service, communication and incompetence from Posterous. Ironically, Posterous is owned by Twitter. Twitter "Tweets" are public. Twitter said so. Edit: Big deal. 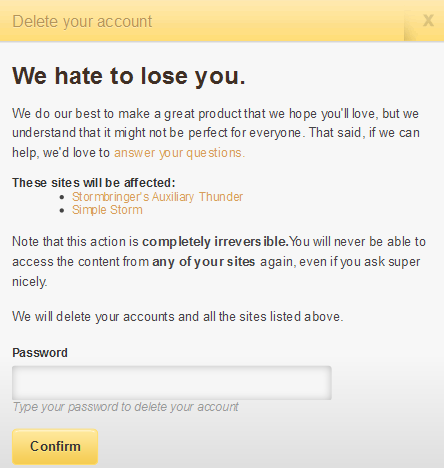 Posterous is shutting down anyway. Video: Are There Scientists Who Reject Evolution? Now, I know that there are people who will go with redefinitions and a "No True Scientist" fallacy here, that true scientists accept evolutionism; anyone who rejects evolution must be an unedjamakated fundie. But that is obviously fallacious. It is also an attempt at poisoning the well and an appeal to ridicule. This short video will inform you of the truth. Before you get your knickers in a twist about the use of the word "idiot" in the title, let me point out the historical setting. A "useful idiot" was a supporter of the Soviet Union in the West, and the Soviets held them in contempt. They blindly followed fatally flawed ideology. Zack Kopplin is being used by atheistic evolutionism. Like Bill Nye, he is unclear on several concepts, including the difference between operational and historical science, the profound lack of importance of evolution to scientific development, and more. He has been deceived by fundamentalist atheist evolutionists and is adored by Richard Dawkins and other proselytizers of atheism. The religious dogma of evolutionism cannot withstand scrutiny and it cannot tolerate competition. Many seek to punish doubters of evolution. (It must drive them batty that this date has been established as Question Evolution Day, huh?) Atheists and evolutionists are usually bigoted and intolerant of any views but their own. They support each other in their dishonesty and oppose free speech. That's right, I said it! Another tactic they use is to shield inquiring minds from evidence that is embarrassing to evolution. They use ridicule, screaming "Liar!" at anyone who says evolution is wrong, straw men, ad hominems, genetic fallacies, poisoning the well and other juvenile tricks. When those tactics fail, they use the corrupt judicial system for leverage. There is a Louisiana law in place to allow supplemental materials in schools to help students develop critical thinking. But no, that must be stopped! Evolution must be blindly accepted and defended by Darwin's Stormtroopers. God forbid (heh!) that people learn to think for themselves and actually examine the evidence! Students are being brainwashed with evolutionary ideas in almost all public schools and museums, and they are expected to accept it uncritically. We’ve made this point many times over the years, but a recent news story has made the brainwashing even more obvious. In 2008, Louisiana passed a bill that would allow teachers in the public school system to “use supplemental materials … to help students critique and review scientific theories.” Such critical thinking skills should be a part of an education process and are part of many state education standards. Well, a 19-year-old student at Rice University, Zack Kopplin, is on a mission to repeal that law. He is being praised by the secular world for his ambition, as evidenced in a recent article about him. Atheistic evolutionists do not want any talk of “critiquing” or “thinking critically” about evolutionary ideas, because evolution is their way of explaining life without God, which is why we call evolution a religion. 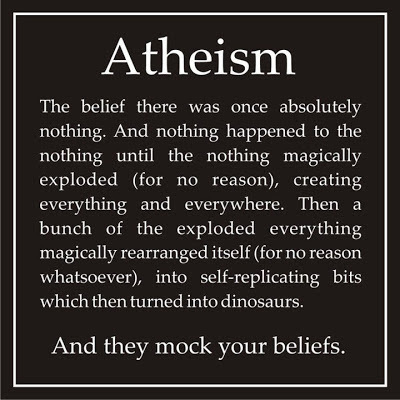 Despite their claims to the contrary, atheists use evolution as their religion to replace God. Evolution is a foundation for their set of beliefs about life and how it arose, just as creation, as described in Genesis, is our set of beliefs about how life arose. Atheists blindly hold to evolution because of their rejection of Christ. Zack Kopplin has seemingly declined to talk about his personal beliefs about God, but many atheists have basically claimed him as one of their own, including the Friendly Atheist, a well-known blogger, who published a post the other day calling Kopplin an atheist. Intellectually honest people can read the rest of "The Legacy of Brainwashing" and learn something. (Also, Tony at Defending Genesis is on the same trail.) Others can go cry to their friends about how the big, bad creationists are telling the truth again. Atheist "Research" and Deception on "Evolution Weekend"
It must drive Michael Zimmerman and other misotheists around the bend that there are people who are not interested in his "Evolution Weekend" apostasy drive. 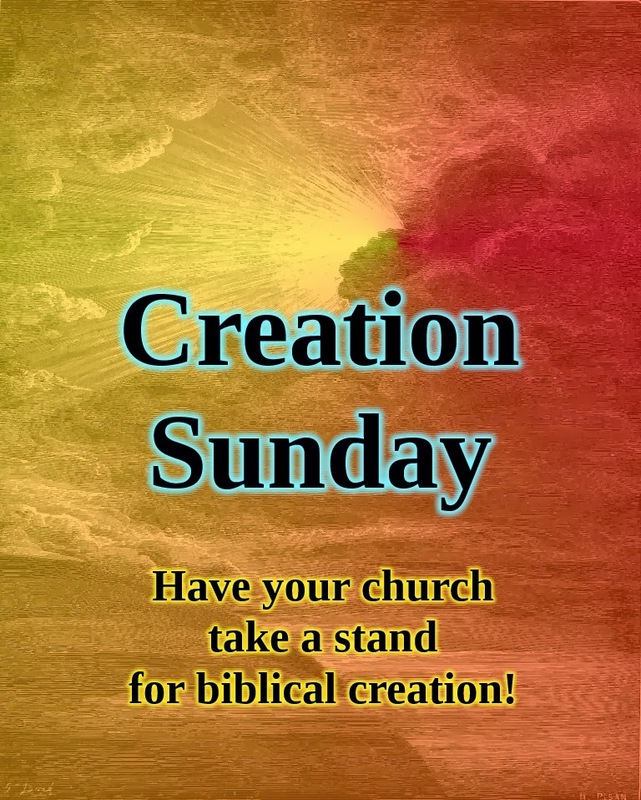 F'rinstance, there are Bible-believing Christians who take a stand and proclaim "Creation Sunday" every year since 2006. As I've said for a while now, hate stupidifies. (For the atheopath readers, that's stupid-i-fies, it makes people stupid.) Their emotions cloud their reasoning abilities. There were some interesting things in an article from Zimmerman that ran in February 2012. (I blundered across it a while back, forgot it, found it again.) He was busy demonizing Ken Ham and portraying him as someone who is only in it for the money. (Perhaps Zimmerman is assuming that Ken Ham has the morality of so many atheists.) In fact, I'd like to see a comparison of who gets more money, Ken Ham or Richard Dawkins. Yeah, that'll shut him up! Third, and perhaps most tellingly, every year creationist organizations spend an inordinate amount of time attempting to disparage Evolution Weekend. If Evolution Weekend were not an important event, creationist groups would ignore the celebration. Instead, they attack it -- and use it as a way to raise money from supporters. This year was no different. 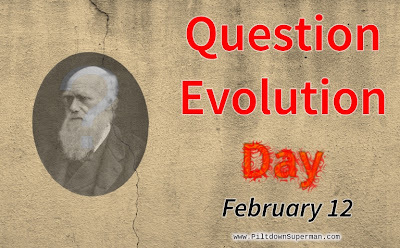 Indeed, as The Christian Post pointed out, something called "Question Evolution Day" was created this year to combat the efforts of The Clergy Letter Project. Given all of the T-shirts, bumper stickers and related paraphernalia that sponsors were hawking, "Question Evolution Day" might well have been a boon to the economy, but there was no evidence that it promoted meaningful dialogue. Again, seriously? If Zimmerman had ever had any desire to do actual research, he took said desire, tied it to a chair and threw it into the Hudson River. I have some bad news for you, Sunshine: I am the one who started "Question Evolution Day", which was inspired by Creation Ministries International. Not only does it have nothing to do with Answers in Genesis, the Zimmerman article I'm quoting demonizes AiG and Ken Ham. I did not market any merchandise (I'm just a guy doing this after work and on days off, not a part of an organization). No money coming in here, but it does go out on occasion. As many churches observed "Evolution Weekend," some congregations and other groups decided to celebrate a different perspective on the origins debate with "Question Evolution Day." The Feb. 12 observance was meant to encourage people to skeptically approach Darwin's theory of evolution. It was coordinated by multiple groups including the Traditional Values Coalition, Creation Ministries International, and the website Piltdownsuperman.com. 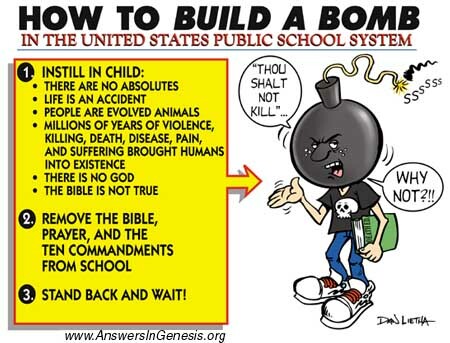 "This is not designed to teach Genesis per se, nor is it a platform for debating the age of the Earth; there are plenty of other places for that," said Bob Sorensen of Piltdownsuperman.com, to The Christian Post. So I can sorta see where a tinhorn who read hastily and did not bother to do research might get the idea that it's in response to his "get the liberal Christians to compromise more and join with other religions" stuff. The number of churches that Zimmerman has recruited is misleading (and fewer than in previous years). He lists churches that are so liberal, their doctrines cannot even be recognized as Christian any longer. Including Unitarians, "New Age" groups, Buddhists (!) and others that would rather align themselves with atheists than actual Bible-believing churches is disingenuous at best, and misleading. Still, whatever it takes for an evolutionist atheist to look good, huh, pilgrim? I can lower my standards and use the same fallacies that Zimmerman used: It is obvious that education systems will crank out a doctorate for anyone with enough money to pay for it (especially atheists), because he does not show the ability to do decent research, and indulges in selective citing. But I won't indulge myself in that fallacy. I will say that his "research" was very sloppy. To be a consistent atheist, you cannot follow where the evidence leads. At least, not if you see that the evidence shows evolution is not science and that there is a Creator. No, even though the Creator is the rational conclusion, emotion and blind hate keep the irrational atheist from getting there. Instead, they have to believe in some magical things that defy reason. Things that lead them to the magical fairyland of evolution, and seething, bitter hatred for Bible believers and for Question Evolution Day, February 12. Edit: For those who claim that evolution is not concerned with the origin of life, and that such a thing is not even taught, that is the opposite of the truth. Here is one example.